"The voyage of discovery lies not in seeking new vistas but in having new eyes." Photo by Herb GoldbergI have been creating art my entire life. It feeds my creative outlook giving me a vehicle to place my images. My art is inspired by healing images, words, patterns, color and light that supports and nurtures me and perhaps gives the viewer peace, wonder and hope. Painting surrounded by Mother Nature’s great masses of color where the constantly changing light is an on going challenge to 'interpret my visual world upon the flat surface.' I continue to strive to see how a particular light affects the world, depending on the light conditions and relationships between the light and the shadow areas and how they come together to create the illusion of the subject. I primarily use a palette knife, building upon layers, allowing for the subtle color changes in large masses, which seems to be a never ending search. faux walls and floor painting. Over the years I have found that time is short. Love fiercely, be in touch with loved ones, do community service and live each day to the fullest. creativity and dreams to explore all possibilities. Holly Aloha Jaynes, Daughter of Aloha Carolyn Jaynes, Granddaughter of Carrie Aloha Fall, Aunt of Julie Aloha Jaynes, Great Aunt of Shirley Aloha jaynes. We are not Hawaiian. My Great Grandmother named her daughter after a friend who moved to Hawaii in the late 1800’s. Aloha is Hawaiian for hello, goodbye and “In the spirit of love." I am fortunate to live on Boston’s North Shore in the historic seaside town of Marblehead, a peninsula surrounded by the ocean and harbors. It's a painter's paradise. The light here is wonderful for plein air painting and there are endless land and seascapes, architecture, animals and people for subject matter. 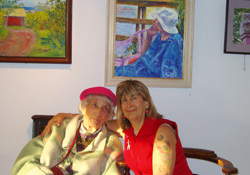 Making art with people across the lifespan, helps to encourage them to believe that they indeed have imagination and the creativity to also live an art full life. I Graduated from Vesper-George School of Art and worked as a graphic designer/art director for several years. I received my BFA from Massachusetts College of Art with a dual major in painting and photography. Therapy, which combines the creative arts with healing and psychotherapy. the coast of Maine. I admire and am inspired by artists Hans Hoffman, Henry Hensche, the Impressionists and many of the early and contemporary photographers, too many to list. 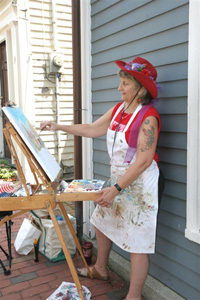 at Marblehead Arts Association's Hooper Mansion. Universalist Church's Stetson Gallery, June, 2009. 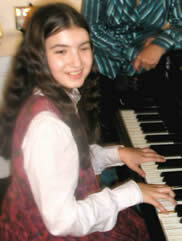 Accomplished pianist and 13 year old friend, Kathi Marcos Alphin, played and sang a composition she wrote to poetry. Friend, Louis Stella, of Salem MA, also played the piano for Holly's Reception in the Ballroom Gallery, Marblehead Arts Association 2009 Exhibit. The Tea Tree is a 6' rusty iron rod sculpture from which oversized collaged tea bags hang. The pseudo company's name is "Spot O Tea". On the back of each label is a tea quote. Left, Back of the Old Town House, Plein Air, Painting the Town. Winner of the Judge's Special Award & The Louise Remick Brown Award. Time with my partner and our animals, gardening and making garden art, walking in the woods, along the ocean, singing with women's group, Calla Lily, hospice singing with Threshold Singers, riding my electric bicycle and meditation with The House Sangha of Marblehead and Salem. Attending Rowe Camp and Conference Center, Rowe, MA, WomenSoul more than 25 years. Community work, locally, or New Orleans and mobilizing to help others is an important part off my life. Click here to view my art dedicated to New Orleans. * Don Howard Award, Mixed Media, "Fishing For Humanity"
First Prize and Honorable Mention, Lafayette Rehab Center, Marblehead MA, photography, “Tribute to Our Elders”. Association's home, used for brochures, ads and invitations. Guess What's In the Box? Marblehead Cod Fish Festival, Hand-painted cod, "Marble Head Fairy Cod Mother"
Great Hall, Boston Public Library, Boston, MA, Pro Arts Exhibition, photo.